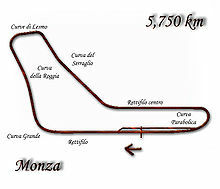 The 1969 Italian Grand Prix was a Formula One motor race held at the Autodromo Nazionale Monza on September 7, 1969. It was race 8 of 11 in both the 1969 World Championship of Drivers and the 1969 International Cup for Formula One Manufacturers. The race was notable in that less than a fifth of second separated the winner from the fourth-placed driver, and is generally reckoned to be the closest 1–2–3–4 in Formula One history. Jackie Stewart and Matra-Ford claimed the Drivers' and Manufacturers' titles respectively, with three races still remaining. ^ "1969 Italian Grand Prix". formula1.com. Archived from the original on 9 January 2015. Retrieved 22 December 2015. ^ "Grand Prix Results: Italian GP, 1969". GrandPrix.com. Retrieved 7 February 2016. ^ a b "Italy 1969 - Championship • STATS F1". www.statsf1.com. Retrieved 1 March 2019. This page was last edited on 18 March 2019, at 16:26 (UTC).